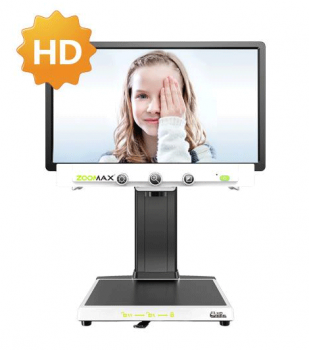 Zoomax Panda HD with the high specification and compact design offers the most attractive advantages of a full desktop electronic magnifier,crisp image in high definition, intuitive use, space-saving and movable screen design. Are you ready for the large viewing experience? Equipped with h level igh definition camera and 19'' screen, Zoomax Panda HD provides crisp image for full page reading at all levels. You can do homework, play hobbies or read letters from kids at any time. It is very clear. No bother of memorizing again and again; anyone, especially senior people can easily zoom in/out, change high contrast colors and brightness by using 3 big and intuitive buttons. The placement and function of all knobs is based on years of low vision research, creating the most user-friendly interface accessibility. Just plug and read. The compact structure of Panda HD fits the apartment perfectly. High contrast black and white design both on appearance and buttons catches your eyes anywhere. 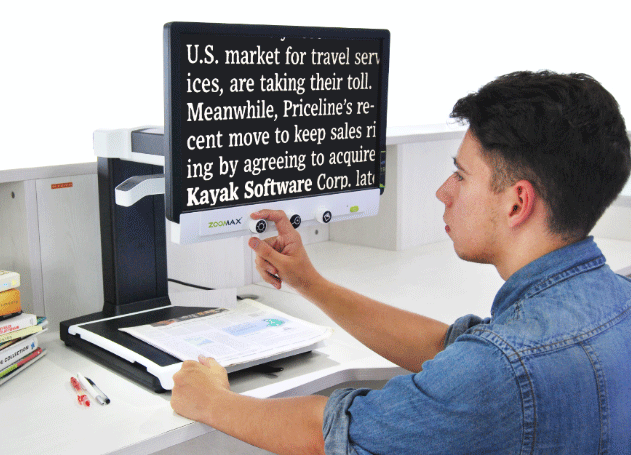 It is easy to reach and control for visually impaired users compared with most desktop video magnifier. With upgrades both on hardware and software, the high-quality desktop CCTV Panda HD offers excellent reading experience while at an affordable price.